Three men have been arrested for assaulting traffic police officers after being pulled over for a breathalyzer test in the southern Vietnamese province of Dong Nai. 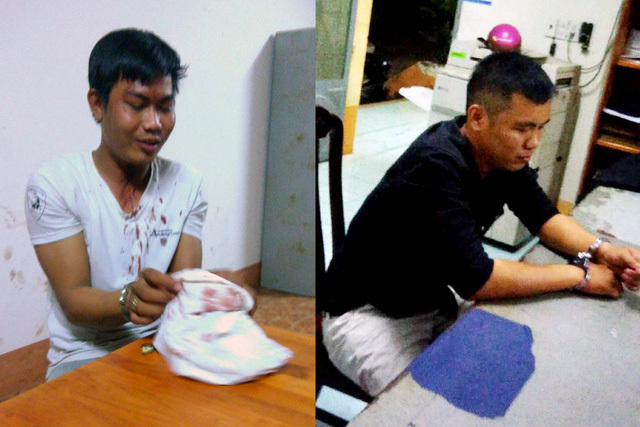 Nguyen Trong Duc, 26, Nguyen Trung Luc, 25, and Nguyen Trung Tri, 19, have been taken into custody for obstruction, the provincial police department confirmed on Sunday. The three men were pulled over when they were traveling on two motorbikes in Thong Nhat District by a group of five police officers, who believed they were driving under the influence of alcohol, at around 9:20 pm on Saturday. As they were asked to take a breath test, the men did not cooperate and began to push and provoke the law enforcement officers. During the row, Luc ran into a nearby house and returned with two knives. He gave one to Duc and the two began attacking the policemen. Tri also took part in the assault by using his helmet. One of the police officers, Tran Long, eventually had one of his fingers nearly cut off, while his fellow officer, Tran Trieu Pha, suffered some injuries on his face. The three suspects were apprehended even though they had tried to hide themselves inside local houses. Pha and Long were admitted to the Thong Nhat District medical center for emergency treatment, before the latter officer was transferred to a local general hospital to have his finger reattached.